The Aluminium 40mm profile is suited to all domestic and some commercial installations. 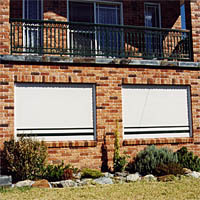 It provides excellent protection against Heat, Noise, Light, Bushfires, Cold, Storms and best of all Intruders. All controls and locks on your Rollashield Slimline Aluminum Shutters are operated from inside. Unlike bars, in case of fire they’re easy to open for a safe exit. Automatic Top Locking is incorporated in every shutter with optional keylock available. Easy to roll down for maximum security with a look of elegance. Simply roll them up again to restore your view. Manufactured from prepainted milled aluminium strip. The aluminium strip is then roll formed and polyurethane foam injected to give strength and insulation to the slat. You don’t have to comprise your view and your lifestyle to have peace of mind. Rollashield Slimline Aluminium Shutters protect your home, your valuables, your furnishings, your family and yourself. Rollashield Shutters are a positive visible deterrent to intruders and vandals. Rollashield Slimline Aluminium Shutters on your windows form a shield around your home against intruders, noise, heat, glare, storm and hail damage. They’re designed and manufactured in Australia using marine-grade heavy duty aluminium for maximum strength and durability to suit Australian conditions. Reduction of heat through your windows. With Rollashield Slimline Aluminium Shutters you control how much heat and glare comes through your windows and SAVE MONEY on air-conditioning. Reduction of noise through your windows. With Rollashield Slimline Aluminium Shutters you control the noise from traffic, aircraft, noisy neighbours, barking dogs and lawnmowers. Reduction of heat loss through your windows. With Rollashield Slimline Aluminium Shutters you keep the cold out and the warmth in. SAVE MONEY on air-conditioning. Prying eyes and ears can’t penetrate your shutters.